Nicolle Hrabe, 36, personal concierge and owner of utilizeMytime. For three years during and shortly after school, I worked as a sales assistant at Myer, and then found an accounts clerk job in superannuation -a bit of an unknown industry at the time, but one that proved great career grounding. Since then, I worked on and off as a super funds manager in various companies for a decade. After doing the working holiday thing in Europe for a couple of years, I returned home so proud of Melbourne and, to share that, started tour guiding. I loved the work but realised it wasn’t that viable, so in my late 20s I enrolled in a diploma of tourism at William Angliss Institute. I was so focused on that course and working in event management that I ended up winning the State Training Board Achievement Award and the award for the school’s most outstanding tourism graduate. After graduating, I rang, visited and sent off my resume to so many companies and finally landed an eight-month contract as a development coordinator with Very Special Kids (which supports children with life-threatening illnesses). It was fun, fulfilling work; the type that made me realise I could combine giving with earning a living. I met a manager of the Victoria Titans National Basketball League club on a Very Special Kids family day and was soon offered a job there as operations and events manager, controlling game operations, merchandise, organising company events and some marketing. Fifteen months later, in mid-2002, the club folded, so I returned to the super industry because it was easy, good money, and stable. After several years working long hours, I was itching for change. I’d lie in bed on Sunday mornings wondering how people do it all -the cleaning, the washing, the errands ? when they work so much. I started really assessing my key skills and thought about the ways I could use my love of organisation, working under pressure and juggling tasks to help others. 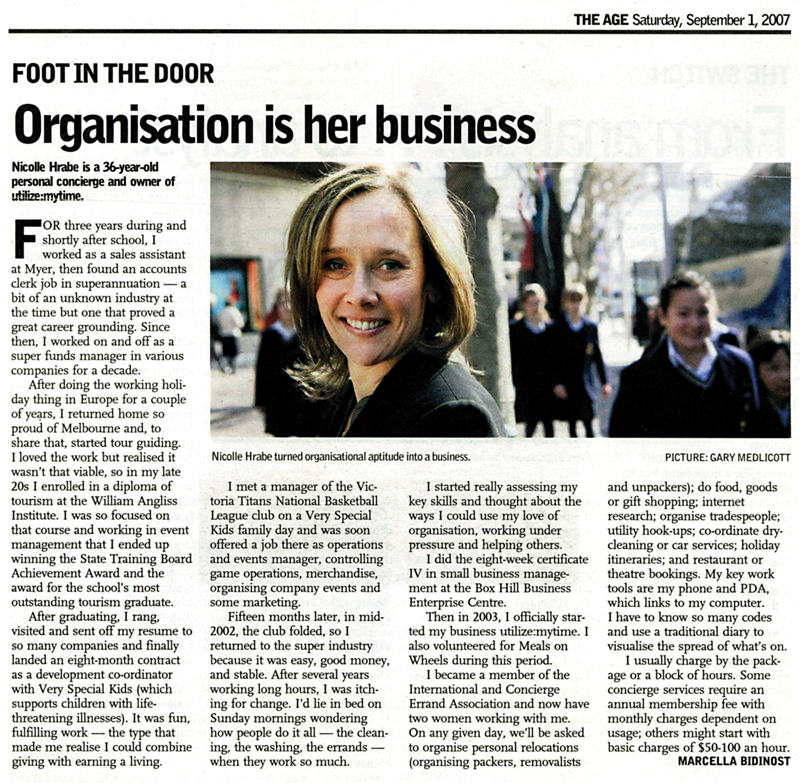 I did the eight-week Certificate IV in small business management at the Box Hill Business Enterprise Centre and did some serious research on my business plan, surveying over 200 people in corporate Melbourne. For my efforts, I won the centre’s best business plan award. Then in 2003, I officially started my business: utilizeMytime. I also volunteered for Meals on Wheels during this period. I became a member of the International and Concierge Errand Association and now have two women working with me. On any given day, we’ll be asked to organise personal relocations (organising packers, removalists and unpackers); do food, goods or gift shopping; internet research; organise tradespeople; utility hook-ups; coordinate dry cleaning or car services; holiday itineraries; and restaurant or theatre bookings. My key work tool is my phone and PDA, which links to my computer. I also have to know so many codes and use a traditional diary to visualise the spread of what’s on. I usually charge by the package or a block of hours. Some concierge services require an annual membership fee with monthly charges dependent on usage; others might start with basic charges of $50-100 an hour.